Eschatology is that aspect of biblical doctrine dealing with “last things” (from Greek eschatos, “final”). In 1 John 2:18, John describes the times in which he wrote as “the last hour,” evidencing that he lived in immediate anticipation of Christ’s Second Coming, just as have Christians in every generation. He saw his era, as do many believers today, as one in which the present evidence seemed to argue that his was the concluding generation. This is not an unhealthy attitude: Christ Jesus desires that His people expectantly anticipate His return (Matt. 25:1-13; 2 Tim. 4:8). In his first epistle, John not only writes of the lateness of the hour of history as he views it; he also addresses the subject of Antichrist, a theme commonly discussed when eschatology is studied. The spirit of antichrist, the Rapture of the church, the Great Tribulation, the restoration of national Israel, and the millennial reign of Christ on Earth are among the many subjects the Bible describes as “last things.” The Bible specifically says these things shall occur. However, it is not clear about the exact time; and in many cases it does not conclusively give the sequence or precise manner of the fulfillment of such events. The Spirit-Filled Life Bible does not embrace any conclusive point of view concerning these popularly discussed subjects. Rather, it seeks to help fellow Christians clearly understand one another’s viewpoints in order to assist dialogue and to dismiss bigotry. It is probably not reasonable for one Christian to be divided from another on the interpretation of things yet future, things of which neither can know the exact outcome until their actual occurrence. 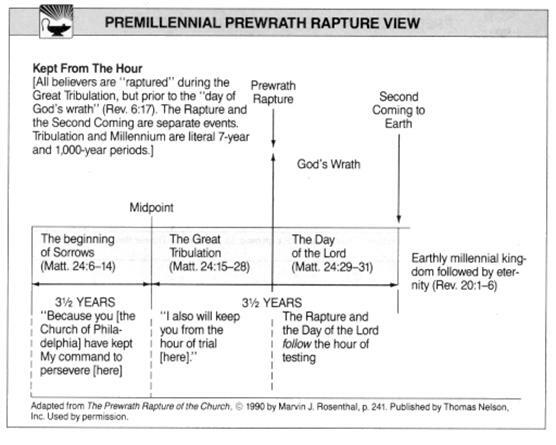 Both the Rapture of the church (including the Second Coming of Christ) and the Millennium (or the 1,000-year reign of Christ on Earth) are centerpieces of the prophetic future. Honesty with these two events, which are absolutely certain in the Scriptures, shows they are absolutely not precise in designating either a specific time or a conclusive method of occurrence. In determining how this wonderful book would be approached in this study Bible, the editorial team decided to take a very exciting step. We feel this will provide’ the reader with a most unusual and especially edifying resource in studying the Book, of Revelation. 1. Two basic interpretive approaches are annotated throughout. The reader will find the classical, historic approach as well as the approach of the dispensational interpreter. At each text where the dispensational interpretation is noted for comparative study, the words DISPENSATIONAL INTERPRETATION appear, and a bracket runs the depth of the note in its margin. All other annotations are either (a) general information involving no interpretive bias, or (b) may present the interpretation of the classical, historic approach. 2. Two capable scholars have contributed contrasting noted In the Introduction and Notes for Revelation, Dr. Earl W. Morey takes the classical approach to Revelation by blending the “contemporary–historical” and the “spiritual” interpretations. He affirms Revelation as a series of genuine prophetic messages that conclude with a vision of “a dynamic realized spiritual Millennium.” His approach is evangelical, conservative, and consistent with the historic traditions that view the church as the body of Christ—as a people equipped with the full resources of the Holy Spirit’s power to actively represent the authority of Christ the King and to extend that kingdom authority throughout the Earth, through all history. In order to compare this classical approach with a view popular among some Christians, additional notes provide a comparative study in the dispensational interpretation. These have been prepared by Dr. Coleman Phillips, who also wrote the notes for the Book of Daniel. 3. All interpretive approaches honoring Jesus Christ and God’s eternal Word are respected in this study Bible. Throughout church history, theories of interpretation have been numerous and widely divergent. These have been classified as the “preterist,” the “continuous historical,” the “futurist,” the “dispensational,” and the “spiritual.” Different views, however, often have been combined or intermingled, rendering all such classifications imprecise. a. The “preterist,” or “contemporary–historical,” interpretation regards the visions of the book as referring primarily, if not exclusively, to events belonging to the closing decades of the first century, contemporary with the prophet John. The prophecy was concerned with the persecution of Christians instituted by the “beast,” usually understood to be Nero or Domitian, and was continued by the Roman government, called “Babylon.” Revelation was written to encourage believers with the hope that God would intervene, destroy the “beast,” bring deliverance to His people, and establish His everlasting Kingdom. Some preterists advocate that Revelation is concerned solely with the destruction of Jerusalem, the temple, and the old era of apostate Judaism in A.D. 70.
b. 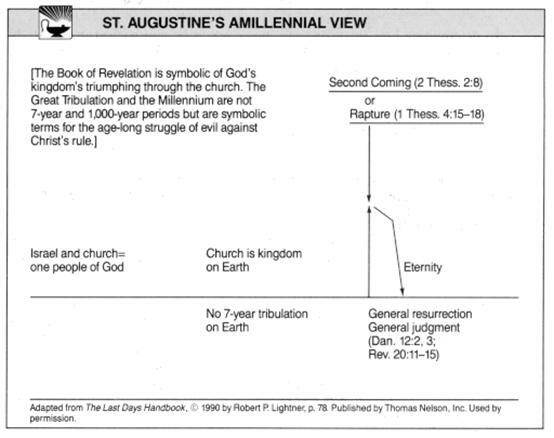 According to the “continuous–historical” interpretation, Revelation contains visions that reveal in advance outstanding moments and events in human history from the days of Rome to the end of this present evil age. Within the book are discovered conjectured references to the various waves of barbarian invasions, the rise of Islam, the Protestant Reformation, the Counter–Reformation, the French Revolution, World War I– and so on. The “beast” has been identified variously as Mohammed, the Pope, Napoleon, or some subsequent dictator. The advocates of this theory ingeniously endeavor to find in European political history the fulfillment of the vacuous visions considered to be in chronological order. Even though it cannot be maintained that specific historical events, from second century to the present, are prophesied in Revelation, Nevertheless historical and world movements do illustrate repeatedly the spiritual principles set forth. c. The “futurist” interpretation sees Revelation as primarily a prophesy concerning the denouncement of history as it concerns the church in the world seven letters are addressed to seven historical churches; and the seals represent the of history—however long it may last—through which God works out His redemptive and judicial purposes leading up to the end. However, beginning with chapter 8 the events described lie entirely in the future and will attend the final disposition of God’s will for human history. Revelation concludes by picturing a redeemed society dwelling in a new earth that has been purged of all evil, and with God dwelling midst of His people, which is the goal of the long course of redemptive history. 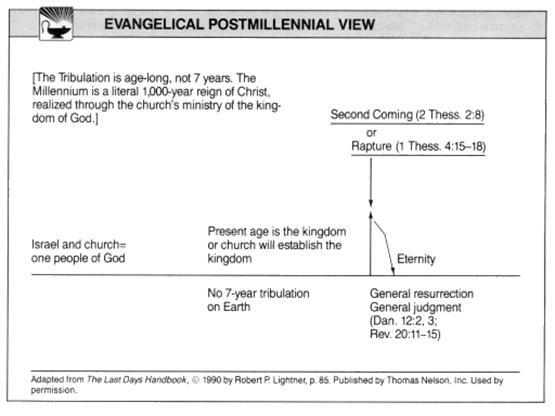 The “futurist” interpretation is premillennial, but not dispensational. It teaches that Christ will return to establish a millennial kingdom on the Earth, but this will not be a political kingdom. d. The “dispensational” interpretation is the most recent to appear in history. The “dispensational” scheme of redemptive history presupposes two different peoples of God throughout history—Israel and the church—and, therefore, two programs of prophecy. The seven letters to the seven churches are interpreted “prophetically” an outline of a seven–stage church age. Revelation 4:1 is interpreted as the Rapture of the church, understood as the secret departure of all believers to heaven before the great tribulation.” The rest of the book is then seen as concerned exclusively with “the great tribulation” and the fate of Israel at the hands of the Antichrist. According to this view, Christ returns to destroy the Beast, to bind Satan, and to introduce His thousand–year reign on Earth. Dispensationalists view this Millennium as the time when the Jewish theocracy, with the temple, the sacrificial system, and the Law of Moses, is restored and the Old Testament prophecies concerning Israel’s future political triumph over the Gentiles are literally—physically fulfilled. 4. A series of eight charts, appearing on the preceding pages, simplify comparative study and will enhance every believer’s understanding. 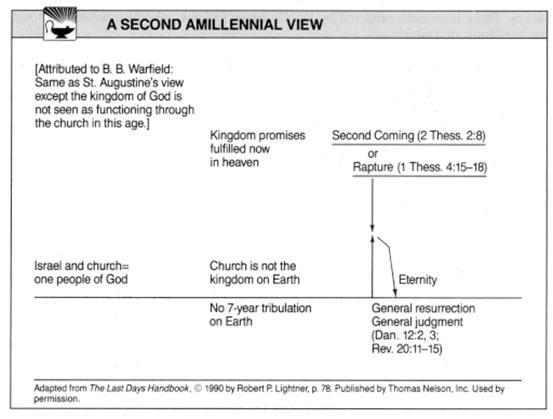 Finally, the reader is encouraged to note Kingdom Dynamics entries at Revelation 4:1, “Interpretive Approaches Book of Revelation,” and I John 2:18, “The Prophecies of Last Things,” as well as the annotation accompanying Revelation 20:1–8, which gives foundational information on different interpretive approaches to the subject of the Millennium. With these resources, it is the editors’ hope that the broadening of insight will not dilute the personal convictions, but will help each one understand the thinking of equally of Christians who view prophecy from varied perspectives. Spirit filled life study Bible. 1997, c1991 (electronic ed.) (Re 1:1). Nashville: Thomas Nelson.